Dark red buds open to white blooms. Dark green glossy foliage resembles a boxwood and turns a deep maroon in winter. Red berries mature to blue-black. Compact low spreading dwarf. Hardy to -10F (-23.3C); height: 5ft. Waxy pink buds and fragrant white bloom clusters. Red berries mature to black. Green foliage turns red-purple in fall. Rounded habit. Hardy -10F (-23.3C); height: 6ft. This variety is most prized for its thick dark green foliage that turns a beautiful purple-red in the fall, accompanied by metalic-blue berries. 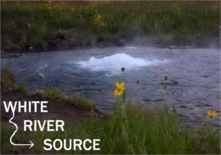 It has an upright mounding growth habit. Excellent border, hedge or specimen plant. Hardy to -50F (-45C); height: 6ft. drooping berries which remain on the shrub long into the winter. Hardy to -30F (-34.4C); height: 10ft. Good choice in dry areas for wildlife food or naturalizing, this variety has rather nondescript blooms in the spring, but colorful fruit in the fall. Hardy to -40F (-40C); height: 15ft. 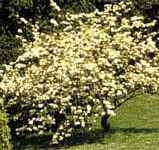 Large shrub or small tree with creamy white bloom clusters on the tips of the branches. Very tolerant of drought and shade. Good border shrub. Hardy to -40F (-40C); height: 30ft. 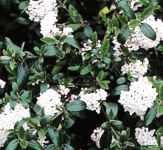 Shrub with clusters of white blooms in the srping, followed by drupes of edible red berries. These are sour, but are frequently used to make teas, jams & jellies. The bark has been used for hundreds of years as an antispasmodic and used to treat muscle cramps associated with ovarian and uterine pain. Hardy to -40F (-40C); height: 15ft. Huge clusters of blooms form large balls and resemble snowballs. Foliage is small and leathery, turning burgundy in the fall. Compact rounded shrub makes a great foundation, hedge, or specimen plant. Hardy to 20F (-28.8C); height: 8ft. 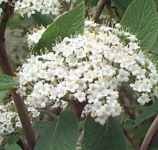 North American native with green foliage and clusters of white bloom, maturing to blue-black berries. Good wildlife planting, hedge or border. Fall foliage is wine red. Hardy to -30F (-34.4C); height: 15ft.